In Another World . . .
A digital collage from my Etsy shop. The theme this week at Inspiration Avenue is "Other Worlds"
that I am giving them Other World status! meant to ward off their evil-doings. have all been used to protect from faeries. and don't travel on the paths that faeries use! Make no mistake, just like all forces of nature, faeries can be both good and bad. Gnomes are known for their kindness to animals. 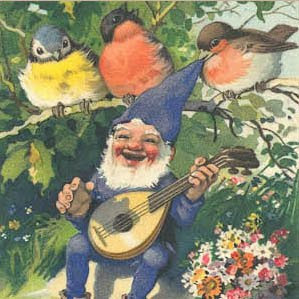 Gnomes are the guardians of animal kind and show little preference for their animal friends, not withstanding their aversion to cats both wild and domesticated. They are known for freeing wildlife from man's traps and for operating on farm animals whose owners have neglected them or who are simply too poor to afford a veterinarian. Their enemies are mainly Trolls, and other beings who would try to destroy them or their homes. Otherwise, they are mostly peaceful beings. Have you ever seen a faery? interpretations of the theme, Other Worlds! soon thereafter will all be displayed together. a chance at the August Giveaway! I love these images. That first one has such color and texture! You've taught me quite a bit about fairies and gnomes. I plant fairy gardens about the yard. On my deck right outside the French doors is a collection of them. I adore creating fairy gardens. Such whimsical fun. Now I must incorporate gnomes! I love both of these charming pieces! Oh wow so wonderful and magical. Awesome other world. Love them. When Mia was younger she saw faeries. She built them houses with beds and gathered food for them. It was a really sweet time. I was toying with the thought of making a fairy garden in my yard and allowing visiters to walk through...but my wacky neighbor spoiled that idea...I don't imagine fairies or fairy visiters like to hear obscenities being screamed. Both of your pieces are magical, Maggie, just like you! These are beautiful other worlds Maggie, quite magical! 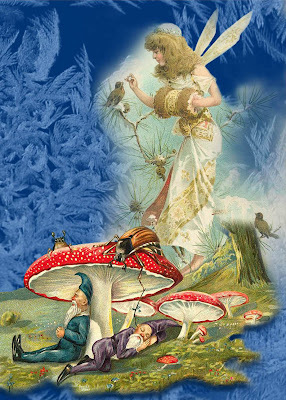 Interesting reading about the fairies. 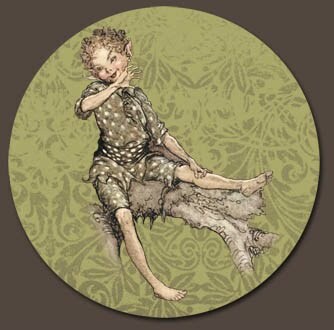 I have some family in the Isle of Mann - there's a fairy bridge on the island and you have to say good morning to the fairies when you go over! Maggie...it is super lovely to meet you..I LOVe your creation..magical and spellbinding! Oh so Gorgeous! and thankyou for visiting me and all your sparkling words! Oh Yes I believe. They fly around my garden. Your digital collage is very pretty. I have not been feelin it this week. So good to come and see yours! Enjoyed your submission and interesting facts! that's just magical maggie!! beautiful! and yes ... i've heard of the faerie's path that you mentioned. actually there was one episode on ghost hunter, and i think they went to scotland and investigated a location called faerie's wrath ... that was where i heard about it! thanks for sharing these wonderful facts!